One of our featured author made this awesome website tour video for us. We are grateful that our customers took the time to let us know what they think about our work and services. Thank you! "I had an enjoyable and productive involvement with the Diamond Publishing Packet through Erika Szabo’s administration. Involving Erika and the experts from Golden Box Books Publishing was the leading choice because of their commitment to authors and a superb completed work. Erika is trustworthy, conscientious, and devoted to insuring outstanding support for the best results. I ordered author print copies and my book is excellent. Praises to Erika. She possesses many talents. Erika has extraordinary professionalism in disposition, reliability, principles, and expertise. Erika and the Golden Box Books Publishing Services was a wonderful experience. I will always treasure this endeavor as part of the finished children’s book because working with Erika and the Golden Box Books staff was very rewarding and enjoyable." I don’t usually endorse individual self-publishers, having had such a devastating experience with my own self-published debut novel, “Miriamne the Magdala”. But, it’s so rare to find a publication that connects on such a personal, professional, and intimate level with Indie authors and our readers—not to mention on such a regular basis—like Golden Box Books Publishing does. Golden Box Books Publishing (GBBPub) doesn’t just feature a set of Indie authors in one issue and then leave them in languishing in the dust—They build a long-term relationship and nurture that bond so that readers become familiar with them and their works. They also offer self-publishing services, run awards contests, and hold special promotions that are easily affordable and sometimes entirely free! How could any Indie author looking for a little recognition and support expect more than that?! I just want to say, “Thank you, Golden Box Books Publishing!” You’ve been a major game-changer in making “Miriamne the Magdala” a respected and recognized work through the Golden Quill Award, and your continuing support to me, and other authors like me, speaks volumes about your dedication to the entire Indie community!" "Golden Box Books earns 5-Stars from me hands down! Not one to dabble in formatting or uploading to publish--there is a service package to fit every author's needs at affordable prices without skimping on quality and clarity. I had the pleasure of working with Erika every step along the way. She was literally available around the clock to see this publication endeavor from beginning to end, and attentive to customer satisfaction. As a result, I'll be launching my latest work with pride. Thank you!" 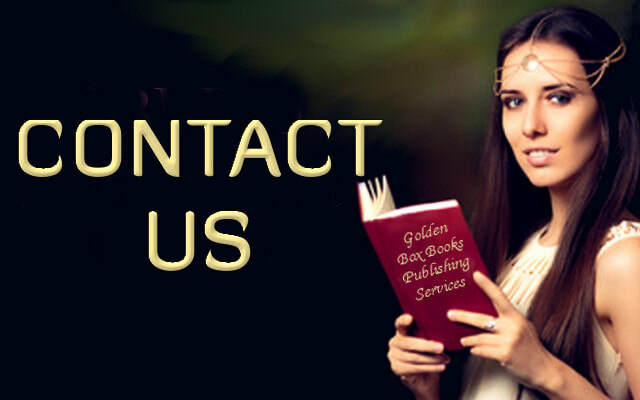 "No writer with modest means and yet an earnest desire to get a promotional foothold for their creation could find a better service than Golden Box Books Publishing Services. I mean what I say, folks. Take it from an old-schooler, whose books used to promote themselves in the old, disappearing brick-and-mortar bookstores: You need a design pro now, to help you prep your publicity ads (and even design your BOOKS), and to guide you to the best chances at exposure, amidst a bewildering sea of content. No one does that better than Golden Box, for very affordable fees." "This is my GO TO service for all of my Indie publishing needs. Reliable and honest people." "I was looking at your website and services offered, and I was really positively impressed by the quality of the services and their affordability. Great job!!" "Your page clearly presents your services, rates, and designs. Everything is branded with great visuals and consistent themes. Thank you for all you do to help other authors promote their work. As someone who has used your advertising services, and will do again, I can honestly say that you're invaluable to the Indie writer community." "Love this page! I can't say enough good things about Erika M Szabo and Golden Box Books' Publishing Services. I'm extremely happy with my association with Erika and her GBB." "Erika's enthusiasm, insight and level of professionalism matches the speed at which she works. She is supportive, kind and extremely easy-going and patient. These are the hallmarks of her Golden Box Books, and the people she has working with her -- editors, proof-readers, etc -- all share her work ethic. Golden Box Books has many publishing packages and services, and I found their prices to be very reasonable and right in line with what I could pay for having so much work done for me. They offer marketing services, promotional videos, and many other services, as well. This was truly a wonderful, enjoyable and pleasant publishing experience for me. I learned so much, I am certainly planning on working with Erika again in the future, especially when the third volume of Mad Shadows is ready to go." "Erika is a pleasure to work with. Professional, proficient and generous with her time, she helped this newbie from start to finish – and the finished product was perfect. The formatting was spot on and the extra touches she added to the interior of the book, made it pleasing to the reader’s eye. I’m not computer savvy and Erika was there with me for each step of the process. Without her I would have been lost more than once. Whatever your self-publishing needs are, I would definitely recommend Erika. I’ll be a repeat costumer for sure!" "I was fresh to self-publishing, and I had no clue about formatting a book. When I messed up, Erika was helpful and offered great advice. When my book needed another round of uploads (my fault entirely), Erika did it with a smile. She is the BEST! I recommend Erika’s services to any author who wants their book to look and read professionally perfect." "Erika is a self-starter, very competent person who knows all the in's and outs of her craft. Whatever it is she will give you everything you need to help ensure the success of your project. Her charges are very fair, and she is a very honest and sincere person." "My novel MISSING is now in print form! I want to thank my coach, Erika M. Szabo, Golden Box Books. Without her my eBook and printed book would never have been possible. She is the smartest, most knowledgeable,and patient person with whom I have had the privilege to work. My deepest gratitude, Erika!" "We will work on your book until you absolutely love it." That was what I read in one of the first emails from Erika Szabo. Receiving the final results did not take long. She quickly had proven that statement true. The best description of Erika's performance is a twirl of wind. Breezing through the sites and programs, she skillfully formatted pages and book cover. Her confidence motivated even me to share her positive outlook for the books final début." "Erika Szabo is a multi-talented woman whose main goal is to help writers and authors. Well versed in the complicated roads to self-publishing, Erika can help with all aspects of preparing a book for print or device. I am eternally grateful for finding her as she has helped me with many different stages of my book’s publishing journey, including document preparation for print, eBook preparation, key word suggestions, and uploading the eBook to both CreateSpace and SmashWords. Her help is expert as well as invaluable." "Erika is very easy to communicate with and she answered my many questions thoroughly and with such patience. Erika provides quality work and she works at a fast pace. I didn’t have to wait on her at all. Erika did a fantastic job of formatting my book. After describing my very vague vision of the book cover, she picked the perfect cover! I highly recommend Erika M Szabo, she is very talented and she does a wonderful job!!"